If you’re stuck with how to do marketing for your various customers, products, or channels, here’s a nice tool to help you. 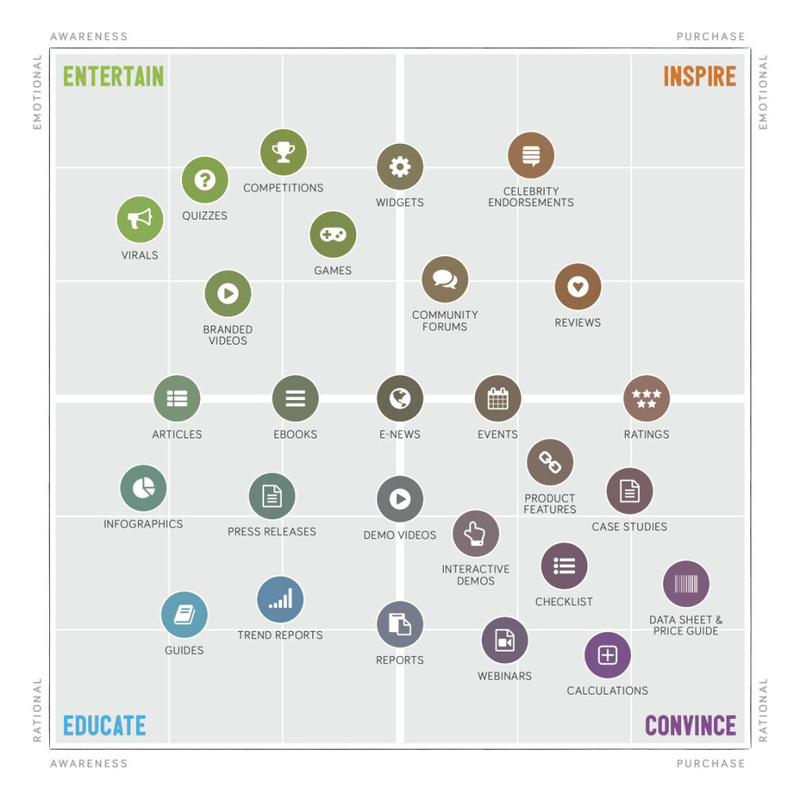 The content marketing matrix is a framework you can use to help direct your marketing based on your specific content goals, whether you want/need to entertain, inspire, educate or convince your audience. It’s a useful tool for guiding customers along their path to purchase in the most direct and effective way. How do you use it? Simple. Think about whether your product, service or marketing initiative is based on a rational or emotional spend. Now think about what you want your customers to achieve from the content you’re producing. Do you want to generate awareness of something new? Lead them to purchase a product? Or share useful information? Based on the corner of the matrix you think your answers are heading, it’ll give you ideas on what types of content marketing you should use. You can also use it in content planning and ensure it caters for a wide variety of interests. Making content fun, engaging and even viral is the best way of creating a buzz and generating awareness. Content like competitions, quizzes, games, and videos gets people talking, actively engaging with your brand and also gives you data for follow up content. This is great in connecting with emotional decision makers especially in the later stages of the buying process. Make it about people and relate to them. Show them reviews and ratings about how other people felt or let them tell it for themselves in a public forum. Endorsements also associate your brand with an inspiring person, bringing their following to your business too. If you have a lot of fact-based content or technical information to share, you need to make this clear and easy to understand for your customers so they can continue to the conversion stage without hesitating. Guides and infographics are often easy to follow and add a visual impact. Reports, articles and press releases work better for more information and detail. Prove that your product or service works. Show off your product features, let people try things via interactive demos and make calculations and guides easily accessible and understandable for everyone. Convincing content has a huge influence on purchase decisions and is often one of the last considerations before a customer converts. Towards the centre of the matrix, you can find e-news, ebooks, demo videos and events. These types of content often have potential to go any way you like because of their flexible nature. See if you can add your own spin here and make it relevant to what your customers want. So, next time your mind goes blank when you think about your content marketing, try using this framework. Think about a specific customer demographic to start with, and the awareness stage or emotion type that would apply to them. Or, give the team at ninetyblack a call, we know content marketing. Let us help you out.